Donald MacKenzie was born in Ayrshire (Scotland) and after learning to play the piano and classical organ, he received his first engagement in 1988 as the resident organist to the Glasgow Garden Festival. In 1991 Donald was the winner of the Senior Young Theatre Organist of the Year in the ATOS International Competition and this won him a trip to San Francisco to play at their Convention. In July 1992 Donald began his long association with the Odeon Cinema, Leicester Square, by playing the famous Compton organ for a number of events including a preview of ‘Beauty and the Beast’ and ‘Chaplin’. In November 1993 he was engaged to play the organ for 5 weeks before each performance of the film, ‘Aladdin’. He was then appointed House Organist and has appeared regularly at Film Premieres, special events and organ concerts. He has broadcast from the Odeon on BBC Radios 2, 3, 4 and the World Service. Donald has played for numerous Royal Film Performances, star studded Premiere and Gala opening nights including five in the presence of Her Majesty the Queen. 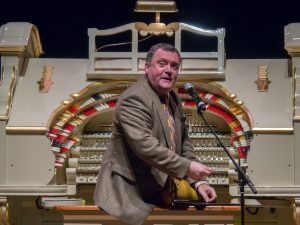 Donald’s musical work and recordings from the Odeon have won him critical acclaim and he has firmly established himself as one of the UK’s foremost orchestral style organists. He also played the organ for the soundtrack of ‘Stagefright’, an Aardman animated film, which won a British Academy of Film Award. When he is not playing for concerts Donald specialises in the accompaniment of Silent Films and in October 2005 he performed his score to ‘Nosferatu’ to a capacity audience in the Usher Hall, Edinburgh. Donald is capable of accompanying everything from the major dramatic classics of the silver screen to the action-packed ‘two-reeler’ comedies. Donald has a degree in music from the University of London. He also has an interest in Steam Trains, Tram Cars and enjoys going to orchestral concerts and the opera.